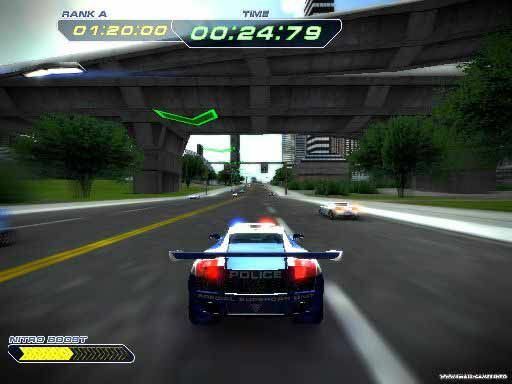 Free download Police Supercars Racing game for PC. It is awesome racing game with Police supercars. You have to clear missions in this game. Police Supercars Racing game is developed by Gametop.com. The game is absolutely free so you have to spend no money to purchase. After downloading and installing, it is very easy to start. The main menu of the game is quite different and shifted to bottom of the screen. This menu has 5 items, Continue, New Game, Options, Help and Exit. Continue option will be enabled after starting new game and when you play it again then you can start the game from the last point. New Game will take you to the starting of new game. First of all you have to enter your name. You can write it with Player_ prefix but you can rewrite it with your own. Now you have to select your mission. There are 16 missions in this game but at the start you have to select first mission only. When you will clear this, the next mission will be unlocked. You will get some Rank A, B or C after completing the lap. When you will complete the lap, the mission will be completed and you can play the next mission. After selecting the mission, you have to select your car. There are 4 cars in this game which are L560 “Bullet”, C850 “Cheetah”, B1000 “Meteor” and P1200 “Photon”. Just like missions, there are only one car which you can select at the start. So you have to start the race with L560 “Bullet”. When you will complete 5 missions, the C850 “Cheetah” will be unlocked. Similarly, when you will complete the 9 missions, B1000 “Meteor” will also be unlocked while the P1200 “Photon” will unlock after the completion of 13th mission. Options menu has only the sound and video effects control features. Help menu will tell you about the controls. You can move your car using arrow keys e.g. to accelerate, use Up arrow key. To use Nitro, you have to press alt key and the nitre will be started with police sirens. Keep it press unlit the nitro bar at the left bottom of screen will be ended. Left Ctrl button is used for hand brakes. You can use it for sudden turn.